WASHINGTON (Reuters) - The United States and South Korea have reached an agreement "in principle" on sharing the cost of stationing U.S. troops in the Asian country, the State Department said on Monday. "The United States and the Republic of Korea have reached an agreement in principle on a new Special Measures Agreement," a spokeswoman said. "Both sides are committed to working out remaining technical issues as quickly as possible." CNN quoted an State Department official as saying that under the revised agreement, South Korea would boost its financial contribution to nearly $1 billion. 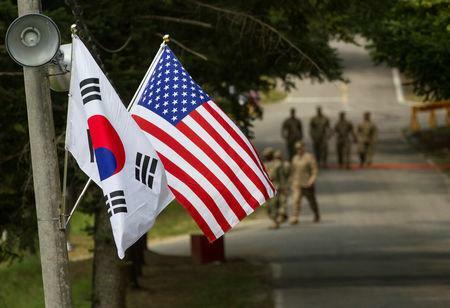 The 2014 deal that expired last year required Seoul to pay about 960 billion won ($848 million) a year for keeping some 28,500 U.S. troops in the South Korea. The allies had appeared unable to strike an accord to renew the deal despite 10 rounds of talks since March. U.S. President Donald Trump has repeatedly said that South Korea, where the United States has stationed soldiers since the 1950-53 Korean War, should bear more of the cost. South Korean news agency Yonhap earlier quoted a diplomatic source in Seoul as saying that Washington appeared set to accept South Korea's request to contribute under $1 billion in 2019, and that the agreement would run for a year as opposed to a previous five-year deal. Yonhap said the two sides were expected to seal the deal as early this week. Its source attributed the compromise to the allies' efforts to focus on diplomacy with North Korea ahead of a second U.S.-North Korea summit planned for later this month. South Korean officials have said Seoul had sought to limit its share to $1 trillion won ($891 million) and make the agreement valid for at least three years. A senior legislator in South Korea's ruling party said last month that negotiations were deadlocked after the United States made a "sudden, unacceptable" demand that South Korea pay more than 1.4 trillion won ($1.25 billion) per year. About 70 percent of Seoul's contribution covers the salaries of some 8,700 South Korean employees who provide administrative, technical and other services for the U.S. military. The U.S. military warned Korean workers on its bases they might be put on leave from mid-April if no deal was reached. Trump announced a halt to joint exercises with South Korea in June after his first meeting with North Korean leader Kim Jong Un, saying they were expensive and paid for mostly by the United States. Major joint exercises have been suspended, which Washington said would expedite talks aimed at getting North Korea to give up its nuclear program, but some small-scale drills have continued.